The late sculptor, David Wynne, designed the interlocking hands that appeared on the British 50 pence piece in 1973. It commemorated the U.K.’s entry into Europe and it was an optimistic and forward looking time for the population. This was also the year that women were admitted to the London Stock Exchange for the first time. Oh well. However, by far the greatest thing Mr Wynne, snr. 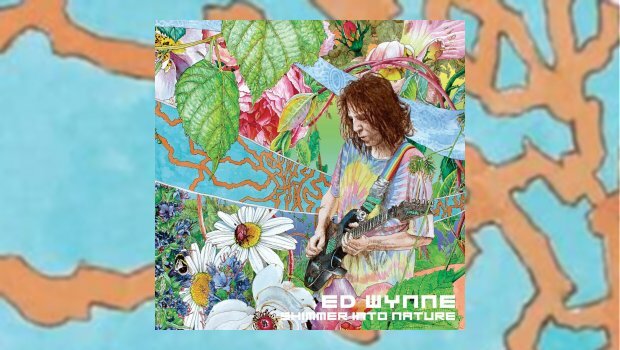 had achieved was being the father of Ed Wynne who co-founded the tremendously experimental band of tent-based troubadours, the aptly named Ozric Tentacles. It’s denomination was apparently decided after a conversation about names for an alien breakfast cereal, hence many references to that early morning snack on their album titles and track names. And the music was just as mad as well. Despite many line up changes Ed has always been a member of the Ozrics, with their latest album Technicians of the Sacred being released in 2015. Fast forward to 2019 and the U.K. is being ripped apart by Brexit and that coin seems such a distant memory now, but the good news is that Ed Wynne has a solo album. Shimmer Into Nature is a genre spliced potpourri of everything that is Ozric Tentacles and then some. The formula doesn’t change too much except that Ed plays with all the toys plus a hint of help from two former Tentacles. Very Gong influenced, especially when the mid-frequency range Hillage-style lead guitar hits, but it’s the rave-ee synth playing that really holds the attention. It harks back to the time that synthesisers sounded new and exciting and as you realise that the rest of the “band” are playing actual instruments the album starts to make sense and its originality strikes. Scottish field recorded birdsong is heard on the first two tracks which are heavily influenced by Ed’s current domicile. After scene setting Glass Staircase forces the toes to tap, Travel Dust mixes thick synth leads with thick synth backing (fans of keyboards will not be disappointed), splashes of reggae, an almost Santana lead, all underpinned with huge sways of percussion. Despite proper playing, the overall mix of the album veers into techno territory, but without any of that boring repetitiveness that only works if you’ve had too many naughty smarties, and Oddplonk is an example of this, but it’s the rock guitar that always brings it back home for the listener. Ed’s bass playing is as smart as his keyboard and guitar with the combination of live percussion and drums, in a psychedelic dance vibe kind of way, yet again raising the distinctiveness of it all. The album ends with Wherble, and being the longest track at 10:22 there is initially more space between the sounds and noticeably every time a cymbal is struck, there is added decay and after a re-listen to the other tracks it appears that this technique is employed throughout – so that’s the ‘Shimmer’ from the title explained. Ed Wynne is a true maverick and has been for the last 40 years. Never conforming to trends or genres because all that is combined in everything he does anyway, co-existing on a planet where rock, electronica, world music, rave, and dance, and even prog all go to each other’s parties and never is there talk of a referendum to leave due to fishing rights or wrongly shaped cucumbers. The Ozric Tentacles started life playing in muddy fields with clapped out generators and Stonehenge backdrops and all Ed has done with this album is provide a better class of welly boots to make the experience a little more comfortable and, of course, expanded the landscape to include the whole planet. A Wynne win situation.